The 2018 LOTTO Polish Championship was a 10-player single round-robin which took place in the Trading Room of the Warsaw Stock Exchange from 12-20 May. The top prize is 20,000 PLN (about $5,500) with the top two qualifying for the Polish Olympiad team. 20-year-old Jan-Krzysztof Duda won his 1st Polish Championship. He was leading with half point before the last round. 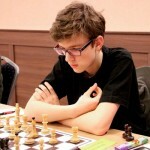 He drew his game against GM Mateusz Bartel. Meanwhile GM Kacper Piorun lost his game, despite this he is second with 5,5 points out of 9. Third is GM Jacek Tomczak with 5 points.